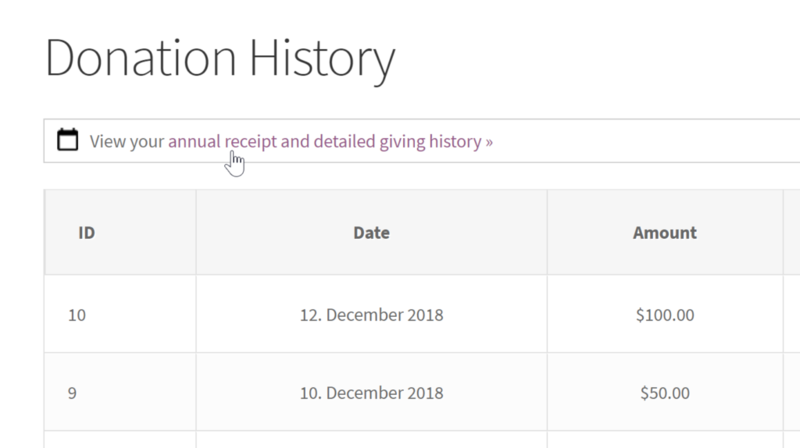 As a service to TOVP donors, the TOVP website DONOR ACCOUNT tab now has a new feature to facilitate annual accounting; Annual Receipts. Donors can download a record of all donations within a given year for their records and tax purposes. Accountants can use the record of their client’s donations to accurately file their charitable contribution deductions using the contact info and donation totals within the annual receipt. Charities and Site Admins can use this convenient method of delivering annual receipts to donors to fulfill their obligations regarding charitable receipts. Please Note: This new feature is only retroactive to 2018. The Annual Receipts provides our website the tools our donors need for year-end tax purposes. This enables them to provide their accountants with the necessary information to report on their annual charitable giving for tax purposes. Providing this convenience to our donors encourages their trust in our organization so that they might be more inclined to continue supporting our organization financially.